A tooth that has become infected as a result of a deep cavity can be unpleasant to experience. When patients come into our office with an injured tooth, we take immediate action to restore health and comfort for the patient. Teeth may become infected for several different reasons. Trauma or injury is one. Another is a result of a deep cavity. Cavities form as a result of oral bacteria. If this cavity is not treated, it can incur further damage, including infection. When caught early, cavities or broken teeth can often be treated with fillings. Once the damage has progressed, root canal therapy may be required. The good news is that root canals are extremely effective. At 32 Dental, our team makes the entire process is comfortable for our patients. While patients often believe that root canals are painful, they actually relieve the pain of infection in the pulp of the tooth. During the root canal procedure, the dentist begins by anesthetizing the area. Patients may feel pressure from the treatment, but will not feel any pain. Removal of infected tissue from the inside of the tooth is done first and then the area is thoroughly cleaned and disinfected before it is sealed. After the procedure is complete, the tooth will be covered with a dental crown to stabilize it and protect it from further damage. 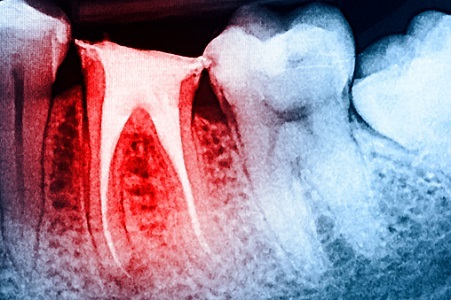 Teeth that have received root canals are often weak and brittle. A crown ensures the tooth can withstand normal bite force. Our team believes that everyone should have access to great dental care. Root canal treatment is one way we help restore oral health for our patients with dental conditions. If you are in the Woodstock area and have tooth pain that you believe may be stemming from a deep cavity, call us today.